This page is to keep tabs on the new studio album, let us know if you have any news. Sept 20 2013 • A special edition of Now What with a bonus live set from the summer tour is due out in November. Full details here. May 8 • Vincent Price will be released on June 7th as a single (download, 5″CD and 7”). As we suspected they are including the otherwise ‘available only as a download to certain customers in Germany’ bonus track First Sign Of Madness as the b-side. The vinyl edition is clear vinyl. Extras on the CD are a video for Vincent Price and two more Hard Rock Cafe cuts, Well Dressed Guitar and Wrong Man. We’re still waiting confirmation on whether the single will be available through DTBOnline store. May 7 • Chart placings for the album have been impressive, the highest charting UK album from the band since House Of Blue Light back in goodness knows when, and straight in at Number One in Germany! You can see that stats on the posting here. The bonus tracks on the Deep Purple single do come from the Hard Rock Café release, which is a bit of a cheap move, as most fans had to buy special editions of the last album just to get the live tracks some years back. It’s not as if they haven’t got any other live stuff either. Bitter? When we ordered 50 copies of the CD single and were rationed to 10 so the tax fiddling Amazon could take all the rest? Of course not! The two Ian’s have been doing some press interviews recently and also appeared on Radio 6 last week. March 21 • The track listing and sleeve art for the album has now been released. Pausing only to wonder how much the bill for the artwork was (! ), the tracks are: 1. A Simple Song 2. Weirdistan 3. Out Of Hand 4. Hell To Pay 5. Body Line 6. Above And Beyond 7. Blood From A Stone 8. Uncommon Man 9. Après Vous 10. All The Time In The World 11. Vincent Price. It’ll Be Me is the bonus track on special editions. Ltd Ed CD and vinyl can be pre-ordered at the DTB Online shop. The Americans are apparently persisting with the old Dual Disc format, so the UK CD/DVD limited edition 2disc set will be just one disc there. March 11 • Tim Summers says he got to hear a couple of clips off the new Deep Purple single via an official French download seller, but when we tried this morning they’d shut the preview audio option. These showed what he describes as one being a bit laid back in a One Eye To Morocco vein, the other a ’69 era rocker. The sleeves for the CD and 7″ singles have been released. DTB Online are stocking the CD but cannot supply the vinyl. Nobody can (or will) confirm where the bonus live tracks are from, though as they do NOT say ‘previously unreleased’ it’s likely they are off one of the many recent live releases. Feb 26 pm – another update! NOW What?! 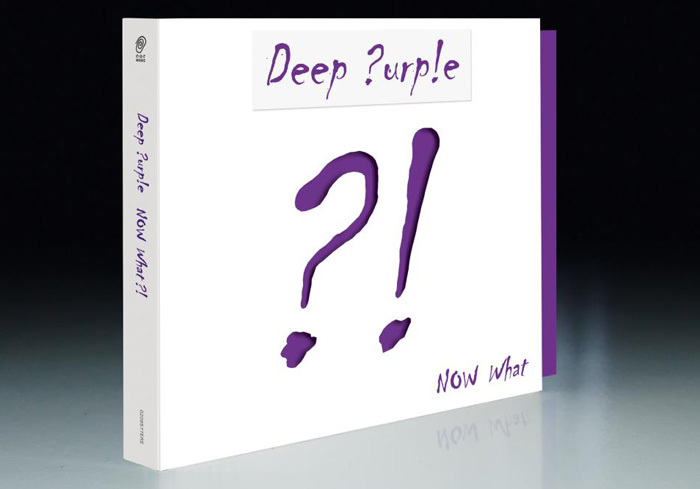 is confirmed as the title of the new album and according to their press release features 11 new songs and “shows a modern and fresh production… to the point that Deep Purple have never sounded so close to the spirit of the 70s in the last 20 years as they do now.” (spot the contradiction in terms in that and win a prize!). It also “has the excellence and elegance of Perfect Strangers and the wild freedom of Made in Japan (that’s the 1972 live recording, not the 2011 version). The limited edition of the album CD includes a DVD featuring the group discussing the album and a bonus studio track (an unnamed cover version). We suggest this is the one to go for (it can be ordered at DTBOnline store now). The group will release a single at the end of March (on vinyl and 5CD: 7″ – Hell To Pay (radio edit) / All The Time in The World (radio mix – edit) (only 1,000 pressed which is woefully small). CD – All The Time In The World (radio mix – edit) / Hell To Pay (radio edit) / Perfect Strangers (bonus track live) / Rapture Of The Deep (bonus track live). Origins of the bonus live tracks are not given. (We are of course assuming All The Time In The World is not a cover of the fab Louie Armstrong track from OHMSS movie!). Thanks again to Tim Summers, who doesn’t like to see me with nothing to do. Feb 26 am – Tim Summers reckons the album is called Now What (?! optional? ), seeing as how they’ve changed the name of their new website and issued the following rather better than usual ‘urban style’ publicity photo. Feb 25 – Formats for the new album include a Limited Edition of the CD, and also a Limited Edition on vinyl. You can pre-order either now at DTBOnline store. There is also an audio clip from another track online, scoot over to the link or read the post here. Gillan updates • Ian Gillan says the album has 13 tracks. Titles include Out Of Hand, Hell To Pay, Weirdistan, Uncommon Man and Above And Beyond (which has a nod to Jon Lord in the lyric). “There’s a big question mark over the name at the moment. And possibly an exclamation mark as well. You can read what you like into what I’ve just said. All will become clear – as mud – later on. That’s all I’m allowed to say. The question mark and the exclamation mark might get you intrigued.” IG is interviewed in the next issue of Classic Rock on sale in early January. Release date • Roger Glover is now suggesting April as the likely release date for the new album. Vocals and lyrics update : RG has said that writing and recording of the lyrics is now completed and they are letting Ezrin get the mix sorted while they’re on the road. Most of the lyrics were done by him and IG down at Ian’s pad in Portugal. Roger has posted a couple of paragraphs about this with some photos here. Meanwhile the band are saying February for release. Thanks to Tim Summers and others. The band were recording through until the third week of July 2012 when Steve took a break for the G3 tour. He says they have more than enough material for the CD already, and good to hear him so upbeat about the project. Latest estimate is an early 2013 release with tour to promote. Producer Bob Ezrin was tasked with arranging a choir on the song Hell to Pay. As one of the founders/owners of the music school Nimbus School of Arts, he asked them for volunteers and 20 students showed up. According to Ian Paice the music on the new album is “fairly heavy”. Good to know they’ve not gone nu-country then! Got the All The Time In The World CD single yesterday. (Thank you DPAS). Sounds so much better than the MP3’s going around the Internet. Yep, but then with compressed files you only get a very much reduced % of the original audio. Why didn’t they include the rejected track, ‘No End To This Party’, as a ‘bonus’ instead of the re-issued ‘live’ ones! So they can add it to the ‘tour edition’ of the album in a few months time? Just bought the new single, cd and vinyl versions (2 copies of the latter at 5,90 € in my regular record shop in Barcelona; I was surprised to find plenty copies to choose from). At first I thought ‘All The Time In The World’ sounded like an outtake from the ‘One Eye To Morocco’ Gillan album and wasn’t really happy about it. Now I really like the track, it makes me feel good. ‘Hell To Pay’ is pure Morse-Purple, it reminds me of ‘Cascades’ but shorter. I’m sure it will work really well live. I’m really looking forward to buy the new album later in the month. As usual since ‘Bananas’, I’m sure at least it will have 4 or 5 really good tracks, I’m not asking much more than that. Happy just to be able to enjoy them in 2013. Abandon was a great-sounding album and I love the production and sound on it, but you’re right, it does seem to have passed people by. But then they did rather give up on promoting themselves for a few albums, whereas they seem to be making a bit of an effort this time round. The track listing is now on …. Hi, I don’t know if anybody mentioned that the producer is Canadian (from Toronto). He did Cooper’s albums… so the new Purple record will be great. I hope they play Canada again. For ATTITW I would haven’t put in those unmelodic choruses after the verses, that broke the melody of the song in my opinion. I think we need to remember these particular edits have been tweaked and mixed to appeal to radio producers. I’m not sure myself if it’s worth compromising music for that aim, but it has seen them played on BBC Radio which is unlikely to have been the case otherwise. But there is a risk in doing this as it colours people’s opinions of the actual album. I do admire the stalwarts who tell me they are not listening to any previews, but waiting until the album itself. I haven’t found a reliable link for the Hell To Pay preview, let me know if you have one. I’d post the MP3 here but probably get dragged into court! It’s certainly rockier but a bit of a mad ‘Gillan Band meets early DP reunion Blackmore’ effort (funnily enough). http://www.youtube.com/watch?feature=player_embedded&v=erazPasthdY – there you go, grab it while it lasts! Thanks Marcin. I have to say that sounds tons better, esp on my spiffing new – well refurbished but new to me – MacBook Pro (bought in anticipation of a couple of weeks photography work which just got nixed – ouch). I can imagine it working quite well on a proper hifi system. Still think it sound suspiciously like Blackmore when the guitar kicks off though! Like the new graphics or not, I find it astounding that whoever designed the graffiti-style look, especially taking in to account that we’re talking about one of the greatest rock bands in the world, couldn’t be bothered to re-draw repeat letters so they didn’t all look the same (the e’s and p’s of Deep Purple). Shoddy stuff. All The Time doesn’t have much staying power, a bit like the Morocco album itself in fact. I love Morocco – played it far more than Rapture. I think this is the site which has now blocked the advance audio options Ottar (either that or my French is even worse than I thought it was!). It now seems to have had an ‘official’ (what’s official?!) release on a number of sites, so maybe they just wanted to stop people jumping the gun. This album has to be a killer. It has to be! With plenty of heavy riffing and wild vocals! This one has to take Purple back to the charts. No more Purpendiculars or Abandons please. More in the line of In Rock, Machine Head, Perfect Strangers. Though it’s hard because Blackers, the main songwriter is not there, but just try dudes! Just saw the band in Sydney on the weekend, and I must say that we went with a touch of apprehension, fearing that this may be the last time they venture our way, and looking at the same old setlist, our concerns were probably fairly understandable. Journey (very good) on first, and then blow me down, one of the freshest, most inspiring and progressive Purple shows we have ever seen, and this was our 15th show over the years. A combination of Bob Ezrin, the new album and Jon’s passing, seem to have imbued them with a fresh slate and a freedom for inventiveness that hasn’t been as pronounced in recent years, and IG was in far better voice than he has a right to be. Without a doubt, Don’s finest hour for my ears, as he seems to have finally settled into his role (perhaps Jon’s passing has given him license), and his call and responses with Steve were jaw dropping in fluency and attack. If this show is an indicator to the band being happy and inspired because of a new album, we may have the makings of a great set of new material to look forward to. To my ears, they haven’t been as collectively inspired since Purpendicular, so this may be the one we’re hoping for? Dave – the distributors cannot guarantee supplying enough of the vinyl single (10 copies is all they could promiss!) so reluctantly we will not add this to our store as we don’t like rationing our customers. We will be able to supply the CD edition, and this is now up on the store under All The Time In The World. Purpendicular still stands tall for me. Let’s hope I can put Now What?! up there with it. What’s modern and fresh if it sounds like the 70’s? They never sounded as close to the 70’s in the last twenty years? Well that was in 1993. Sounds like a contradiction. And yes, the whole album ought to be dedicated to Mr. Jon Lord. Gotta good feeling about this LP. Now that’s a reunion we’ve not seen talked about ever. Of all the splits though theirs was one of the most bitter and still raises hackles. Great band live though. Just ask the manager of Sheffield City Hall. Gillan. Sheffield City Hall 1979. Bloody marvelous. One of my favorite gigs ever. I really enjoy hearing the last few albums when they come up on the old playlist – some great numbers, so going to look forward to more of the same from these great musicians. There – something positive. I’ll go and sit down now. Well certainly there are tracks to go back to on nearly all their last few albums (though Rapture still gathers dust on the shelf here) so fingers are crossed. “11 original tracks” but we were promised “13 tracks”, so two covers then. Perhaps one IS Louis Armstrong, minus the ‘We have’. Why are so many people being down on the album before they even hear it and telling the band to call it a day? If you don’t want to hear it don’t buy it and go and do something that makes you happy. By the bye, there’s a tribute band playing near me soon called PurpleZeppelin. Two thoughts; decent of them to put the better band first, but how can a DP tribute band not have a keyboard player?! … “ the excellence and elegance of Perfect Strangers and the wild freedom of Made in Japan” … sounds like my kind of album! Bring it on! Sounds a lot like Mk 1 to these ears – which is a very good thing! Can’t wait! Should they have given Derek Lawrence a call then?! Hmm, can’t say that gets me excited and so bored of Steve’s widdly picking where everything from the 12th fret and above is played on the neck pickup. Paicey’s punctuation with the toms sounds as if he were unsure of what to do, whereas the a young Ian would have been all over it, showing flare, imagination and hunger. I hope they prove me wrong when I listen to the album ‘cos I want my favourite band to blow me away, show me how wrong I was not to have faith in them. The key for me is if Gillan is in good voice, but I’m not sure he is capable of singing at this level anymore. So far, so good! Both trailers, little as they are, showing great promise, especially the second longer one. Sounds like a more solid classic Purple sound rather than the Rapture sound…. which to my thinking is much much better. Leaning a lot towards a Jon Lord sound with the organ as well, not that Airey has ever been that far away from it anyway. Great to Hear Don Airey prominent. No disrespect to Lord and he would probably have admitted that Airey is more versed on Synths. I was always hoping they would feature Airey more, rather than just using him for color and texture. Ian Paice seems to play a la “Woman From Tokyo” on the audio trailer. Smile ! Nice for Ian to get us going on the title!! Maybe a comp here Simon! Not sure we’ll be getting any copies for competition purposes Neil! Maybe they’ll just run with this as a cover, or perhaps it’s just a stop-gap until they can find a sleeve they all like. Let’s hope they play some of it live! Ok I’m getting a little more excited now, actually I can’t wait. I really hope this album is a gem and dedicated to the memory of Jon Lord. I almost expect his presence to be felt in the music, but maybe that’s just me. Pity nobody thought to bring Jon and DP together to cut some bits and pieces to weave into the album… but I guess this isn’t what the album is about, though they reckon one track does honour the man. Ya, that would have been cool. Perhaps Jon stored some recorded stuff that could be used posthumously? I can’t wait for new release. It will be released on my son’s 38th birthday. So you can do the maths; Deep Purple has been my favorite band for many decades. Both my children were raised on Purple. Now my 4 grand kids are fans! I hope for a US tour to follow. I will plan to see many shows like the “Smoke” Tour where I saw 4 shows. Nice to hear of a song dedicated to Jon Lord. God Bless Deep Purple! So very very! Cool. I’m the biggest DP fan, cannot wait! Ian is the best! Cheers from Los Angeles. Cya soon! I suppose receiving this today means you forgot your coffee again? Cheeky! You can tell I’m on a caffeine free routine that easily can you? “Fairly heavy” in 2013? Morse isn’t Ritchie especially when you’re talking about hard… he’s fast and brilliant, coloured… but he can’t play heavy. I’m not interested in new albums because rarely can we hear anything good nowadays from these old groups…. I can only (and I’m sad to say it) agree 101%. Steve is a great player BUT he is NOT a guitar player for Purple. Great person and great on guitar but NOT in this band. This is Deep Purple NOT at jazz / ELP / band. Do you think Black Sabbath would come up with this kind of thing. NO WAY! Sure it can’t be In Rock again, but you hear what Ian can sing when he was with Tony Iommi. THAT was rock. Why not in Purple? They don’t have a rock guitarist. Last Friday, Mâcon France, they say new album now April 2013. Great show, Steve broke a string, but he continued masterfully. And what is below zero? ‘Love Conquers All’, I assume. I am always stoked for a new Purple offering but with Jon’s passing I am not sure what I will be feeling when I listen to it. I know he has not been involved for 3 lps but…. I am quietly optimistic anyhow. On french TV FRANCE 2 this noon IAN GILLAN says “new album for february 2013” ! If “In Rock” is the heaviest album, say 10 out of 10, then surely “Into the Fire” gets an 11? And the plinky plonky intro to “Anyone’s Daughter” (which cheers me up no end every time I hear it) a nice round zero. Still think I need to do some work on the first three albums to get this scale properly worked out. It’s the middle ranking stuff which confounds, sort of Might Just Take Your Life kind of pitched at around 4 or 5. One for the songs and one for the albums. The album with the tracks whose total gives the highest number must be the heaviest. QED. And then it could be done for line-ups ……. Optimistic but not holding my breath. Of course I will buy it, of course I will play it a lot and hopefully I will be satisfied. I just hope its not too sterile and over-produced. I want raw, heavy, comatose inducing, mind altering, sonic madness of unequalled realization. Alas, there can only be on “In Rock”, but I just hope its better that the last couple. come from this collaboration. At least I wish they can deliver another REAL HARD DEEPURPLIN’ ROCK, supposing that it could well be their studio swansong! Ian Paice, at his drum workshop the other week (17th Sept) said that Ian Gillan was just about to lay down the vocals before they left for Russia, that it was a very powerful album and that they’re all quite excited by it. I was looking forwards to its release, now I’m really looking forward to it. “Fairly Heavy”? Most unlike little Ian to be so descriptive! “fairly heavy”? Is that compared to In Rock or to the last with Morse. I hope it will be compared to In Rock. Yes, we’d heard he was fond of the old choral effect. At least it’s not out of tune kiddies, which mars one or two classics (I have to fade out one Talk Talk album to avoid one grim example). And I don’t mean Grandad either. Haha! Well I’ll be surprised if he doesn’t find an excuse to get some kids on there too… what Talk Talk album has got kids on it? I’ve got a couple of theirs but I’m not too familiar with them. Overall though, Bob’s an interesting choice for Purple. I’m intrigued about what they’ll come up with. From recollection it’s a track called Happiness Is Easy from the Colour Of Spring album. Fab track, but then the kiddies break out at the end. Great band too, I loved following their progress from pop wannabees to out on the edge experimentation (except for their final album which just fell apart). Oh right, I do have that one! I got a few of their albums very recently but it’s the Spirit of Eden album that I keep choosing out of them. It’s fantastic… so it’s probably high time I moved on to another one. Cheers Simon!